Not bad for a week and a half of interspersed knitting! The pattern is The Secret Fan by Adrienne Fong. It has just a little bit of beading but most of it is pretty straightforward knits, purls, and twists. 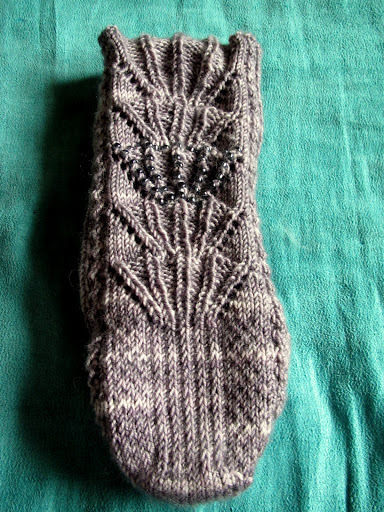 The heel was pretty neat, eye of partridge surrounding normal slipped stitch heel patterning that flowed nicely into the fan on the back. The toe instructions were somewhat unclearly written but I have to give props for how neatly the toe decreases resolved themselves into a centered double decrease, forming a perfect inverted V. I love when a designer pays attention to such details. 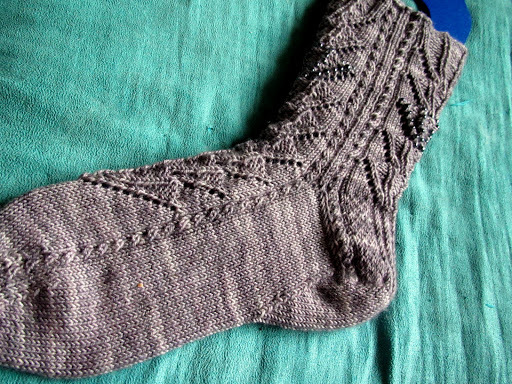 This sock also had gusset decreases on the bottom of the foot, which was new to me but I don’t think I like it any better than having the gusset decreases nearer the instep, I don’t really notice a difference when worn. That pair is supposed to be done by Wednesday, June 19th. Besides the usual impediments to my knitting progress (a.k.a. work and life) I also have a very good friend visiting this weekend (who is not a knitter, sadly) and the yarn I want to use for the socks is not yet wound (and without a ball winder, that’s slow going). So, really, there’s no chance in hell I’ll be able to finish that pair and probably not even the first sock in the next 9 days. 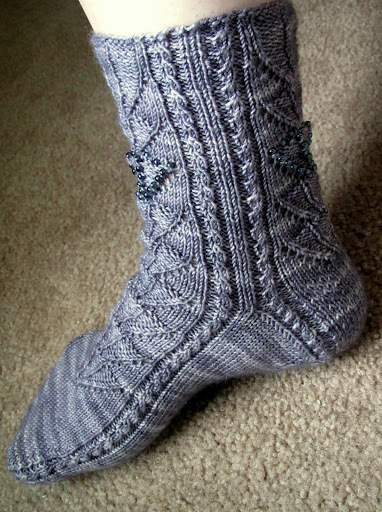 That said, it was pretty fun trying to finish one sock by the deadline. I didn’t quite make it, I’ve been a day behind the whole time, but why not try, right? How’s that for talking myself into then out of then back into a plan, eh? What would you do? This entry was posted in socks, TDS by shoelaceswitcher. Bookmark the permalink.